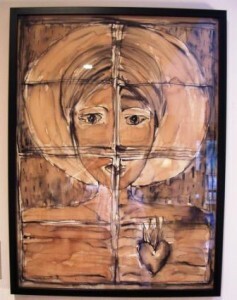 In lieu of sharing icons of Saint Mary today, I’ll share this painting which I love and have in my office. It’s by my friend Pam Santi, and it’s called “Heart on Fire.” Pam didn’t know about Mary of Egypt when she painted this but I was struck by the resemblance when I saw the painting at a show many years ago and bought it. Holy Mother Mary Pray to God For Us. And I’ll wish all my sisters who share this saint with me a Blessed Name Day!